Not all bartending jobs are created equal. For example, at a wine bar you would use a wine key frequently but potentially never touch a bar blade. The opposite could be true if you work at an establishment that focuses primarily on craft beer. Whether you are a tending bar at a dive, at a club, or want to impress friends at home with your mixology skills, you need to master some tools. While the equipment that you need to use may vary by job, the best bartenders are prepared to use every tool in their kit to provide the best experience possible for their patrons. Don’t worry, you won’t hurt yourself. It’s not as dangerous as it sounds, they’re not sharp, relax. Every bartender should own and learn how to open a bottle of beer with this tool. Place the blade underneath the bottle cap, push down, and voila, an open beer. If you haven’t learned it yet, it may be important to develop the skill of cleaning up after yourself. Every bartender should have two bar towels on them. One to clean up any spills and one for drying glassware. If you don’t know how to use a towel, watch an instructional YouTube video. You’re a bartender, you should know how to “unlock” a bottle with a wine key. While there are different styles, you don’t need to break the bank on a quality wine key. Just find something that is sturdy. To open a bottle of wine; open the bar blade, pull down the corkscrew so that the key looks like a capital “T”, then twist the corkscrew firmly into the cork. Once you have done this, fold one side down to rest on top of the rim of the wine bottle, then pull up on the other side to pull out the cork. Shaker tins are used for countless different types of drinks and the art of shaking it should be mastered by every bartender. There are different styles of tins in varying sizes. Some bartenders will use a tin combined with a Collins glass, while others will opt to use a second, smaller tin. While a smaller tin may be more ideal because it will help cool drinks quicker, it also has the added benefit of not being made out of glass. Whichever you choose, it is important that the smaller glass/tin fits snugly into the larger tin so that no liquid escapes when shaking vigorously. After shaking or stirring a drink, place a Hawthorne strainer on top and pour into the desired glass. The strainer keeps all of the ice from being transferred to the final drink, leaving it cool and preventing it from being watered down. Just one thing, place your finger on the designated area towards the top of the strainer so that the liquid from the bottom does not touch you. The customers have no idea where your fingers have been and don’t want your dirty paws in their drinks. Stronger cocktails cannot be shaken in a tin because it can bruise the drink, so they are put into a mixing glass and stirred with a bar spoon instead. 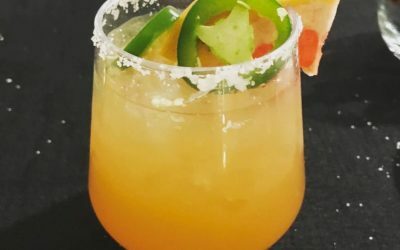 While you do specifically not need a mixing glass to make cocktails, it could be helpful if you work at a bar that specializes in them. Otherwise, you could mix in a Collins glass. While many bartenders use a “free pour,” which is a method of counting the seconds that they are pouring to pour a certain amount of alcohol and/or mixers. It is inaccurate and, while you can get away with it many times, you will not be able to do so if you want to make great craft cocktails. Craft Cocktails require precision and using a jigger can provide that. A jigger has a top and bottom that have different measurements. You can get jiggers in a wide range of sizes but you will generally see 1 ounce/ 2 ounce combinations. Some of the best jiggers have lips on the top that allow easier pouring and may have lines on the interior of them marking, for example, ½ ounce, ¾ ounce, etc. Just remember to fill the jigger all the way to the top, craft cocktails are expensive and it is best to be precise. Placed in the top of a bottle of alcohol, the best speed pourers are metal and take some time to perfect the pouring technique. Place your hand on the neck of the bottle, swinging it upside down quickly before pouring. Unfortunately, drinks will not garnish themselves. The best thing to do is to show up early for your shift, pull out the cutting board, and use your paring knife to cut lemons, limes, etc. so that you will be prepared when you need them. You probably don’t know how tedious it is to peel an orange or a lemon until you need to garnish a drink with a peel. Slowly peel down and away from your body and don’t hold the fruit against your shirt, the customers don’t want to see their drinks being getting extra zest from the lint on your clothes. You could spark a lighter underneath a lemon or lime peel that is about to garnish a drink to unlock an aroma. Also, a lot of drinkers smoke, so you’ll have one to loan out. Any small deed can lead to increased customer satisfaction and an increase in tips. While there are many tools that a bartender could use, these are the most basic that one would need to master to become a great mixologist. Practice and perfect using these tools and you will maximize your potential as a bartender.